Initializes the computation of the fillets. <FShape> sets the type of fillet surface. The default value is ChFi3d_Rational (classical nurbs representation of circles). ChFi3d_QuasiAngular corresponds to a nurbs representation of circles which parameterisation matches the circle one. ChFi3d_Polynomial corresponds to a polynomial representation of circles. V is not on the contour of index IC. Adds a fillet contour in the builder (builds a contour of tangent edges). The Radius must be set after. Adds a fillet description in the builder. sets a linear radius evolution law between the first and last vertex of the spine. sest the radius evolution law. p2d.X() = relative parameter on the spine [0,1] p2d.Y() = value of the radius. the intersection of the fillet with a face which limits the contour is not fully contained in this face. Returns the internal topology building algorithm. Returns true if the contour of index IC in the internal data structure of this algorithm is closed. Warning Returns false if IC is outside the bounds of the table of contours. Returns true if the contour of index IC in the internal data structure of this algorithm is closed and tangential at the point of closure. Warning Returns false if IC is outside the bounds of the table of contours. Returns the index of the contour in the internal data structure of this algorithm which contains the edge E of the shape. This function returns 0 if the edge E does not belong to any contour. Warning This index can change if a contour is removed from the internal data structure of this algorithm using the function Remove. J is outside the bounds of the table of edges of the index I contour. Returns the first vertex of the contour of index IC in the internal data structure of this algorithm. Warning Returns a null shape if IC is outside the bounds of the table of contours. Returns the list of shapes generated from the shape <EorV>. Returns the type of fillet shape built by this algorithm. Returns true if the radius of the fillet along the contour of index IC in the internal data structure of this algorithm is constant, Warning False is returned if IC is outside the bounds of the table of contours or if E does not belong to the contour of index IC. Returns true if the radius of the fillet along the edge E of the contour of index IC in the internal data structure of this algorithm is constant. Warning False is returned if IC is outside the bounds of the table of contours or if E does not belong to the contour of index IC. Returns true if the shape S has been deleted. Returns the last vertex of the contour of index IC in the internal data structure of this algorithm. Warning Returns a null shape if IC is outside the bounds of the table of contours. Returns the length of the contour of index IC in the internal data structure of this algorithm. Warning Returns -1. if IC is outside the bounds of the table of contours. Returns the list of shapes modified from the shape <F>. Returns the number of contours generated using the Add function in the internal data structure of this algorithm. Returns the number of edges in the contour of index I in the internal data structure of this algorithm. Warning Returns 0 if I is outside the bounds of the table of contours. Returns the number of contours where the computation of the fillet failed. returns the number of surfaces after the shape creation. Return the faces created for surface . Returns the radius of the fillet along the contour of index IC in the internal data structure of this algorithm Warning. Use this function only if the radius is constant. -1. is returned if IC is outside the bounds of the table of contours or if E does not belong to the contour of index IC. Returns the radius of the fillet along the edge E of the contour of index IC in the internal data structure of this algorithm. Warning. -1 is returned if IC is outside the bounds of the table of contours or if E does not belong to the contour of index IC. Removes the contour in the internal data structure of this algorithm which contains the edge E of the shape. Warning Nothing is done if the edge E does not belong to the contour in the internal data structure of this algorithm. Reinitializes this algorithm, thus canceling the effects of the Build function. This function allows modifications to be made to the contours and fillet parameters in order to rebuild the shape. Erases the radius information on the contour of index IC in the internal data structure of this algorithm. Use the SetRadius function to reset this data. Warning Nothing is done if IC is outside the bounds of the table of contours. Changes the parameters of continiuity InternalContinuity to produce fillet'surfaces with an continuity Ci (i=0,1 or 2). By defaultInternalContinuity = GeomAbs_C1. AngularTolerance is the G1 tolerance between fillet and support'faces. 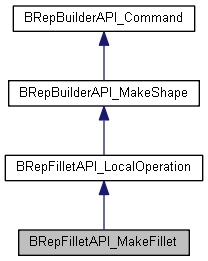 Assigns FShape as the type of fillet shape built by this algorithm. Sets the parameters of the fillet along the contour of index IC generated using the Add function in the internal data structure of this algorithm, where Radius is the radius of the fillet. Sets the parameters of the fillet along the contour of index IC generated using the Add function in the internal data structure of this algorithm, where the radius of the fillet evolves according to a linear evolution law defined from R1 to R2, between the first and last vertices of the contour of index IC. Sets the parameters of the fillet along the contour of index IC generated using the Add function in the internal data structure of this algorithm, where the radius of the fillet evolves according to the evolution law L, between the first and last vertices of the contour of index IC. the Y coordinate of a point in UandR gives the corresponding value of the radius, and the radius evolves between the first and last vertices of the contour of index IC. Assigns Radius as the radius of the fillet on the edge E.